Corovoda is a small town with mountains that offers to you different activity and natural beauty. It’s an ideal place to have a rest and enjoy the nature and the remarkable meal, served traditionally. In company with fresh air everyone want be there to take e big breath and have an incredible adventure time. Bogova offers all of these oppurtunities. It’s a small village in the area about 10 km far to Corovode. This turistic destination, has a calm nature and the rich and variety flora and fauna. Bogova National Park is protect by the ministry of culture and the area is very popular for Bogova Falls. Like turistic village offers modern and friendly acomotadion with reasonabe prices. All the people that loves the nature can be enjoy the walking to mountains with feets abuot 30 minutes. The road is being interesing while you are climbing small hill and you across the small street in there. Walking to the road take you’ll see the waterfall of Bogova. 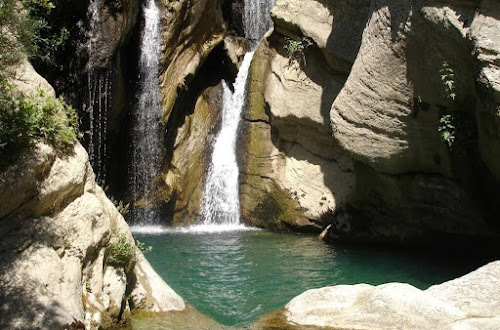 It is 20 m high and 12 m deep, near to waterfall is a place where you can take a rest there for few minutes.The water is fresh, clear and to cold. When you are there you have idea to have a bath in it and to jump from the high. Everything is perfect. All of this, gives to you the feeling of the relax and the fun that can be last for a long time. After this adventure its time to have a lunch that prepare with the chosen food of the zone. It’s sincronized the fried meat of lamb with the house food and a glass of local wine or raki. The new things you have to do and to explore in the afternoon, for the people that want to know the history of the city and the culture. The Historic Museum of the Corovoda is near to the center of the city. There we find old important things of the history of the village, from prehistory to medieval period, from ottoman surrender to the II World War. When you go to museum the guide is here to explain all the details and the hisory for every thing that you find there.